Last night at about 11:00 PM, I was gearing up my Ranger for some MvP's and notice my Old Detachment Ring missing from my character, Upon checking about ten accounts and having no results I log on WarportalSupport to send in a ticket. “A trooper responded, but reported back that my old detachment ring is a possible dupe and asked where i got it from. After looking though my screenshots i provided everything needed for the GM's to help. My account is register since 2011 and i have never encounter a dupe issue until today. I have heard stories on forum about bigfoot encounter's but always assume them to be RMT players dealing with big mvp problems. I had to dig though my laptop PC to find the trade from three weeks ago, On the bright side this is a small item i bought for 1.5 billion zenies but still took the time to screenshot and log the trade. I feel for anyone out there who is having this issue but have no proof / lost screen shots. I will be more careful from now on and verify everything right after trade when dealing with a random person. Stay safe folks ! So, after 3 weeks, did your Old Detachments Ring disappear? Yes, i used it for three weeks and they removed it last night. It should be okay since i provided everything needed, worst case i get 1.5b zeny back. I was lazy to verify and didn't feel like anyone would dupe a fresh OCP for 1.5b and i was wrong. Edited by Trii, 16 March 2019 - 09:32 AM. I see, 3 weeks is a considerable amount of time, so sad. Especially when another OCP arrives. Good luck finding a legit Ring. Im glad the GM is able to detect dupe items and remove them it's kinda sad the player is being punish because they can't fix the dupe problems. It's much harder trying to get an item thats not in the current OCP and i have to go though this trouble again. The moral of this story don't be lazy and just verify it. Did your zeny returned back? Please contact Familiar and Xanubis on forums with your ticket detail and issue. @mashaa My ticket is still in process it's the weekends so i understand. I'm not worried they have responded to me and i provided enough information. You should also send in your ticket's the GM's have improved the website before i couldn't even log on to it for 5+ months. Thanks for the advice, i already sent my ticket 3 days ago, the status still "waiting for agent". Later i will pm them, i am patient to wait the reply since the logs maybe few months ago, which is hard to track so i understand it. Hmmmm weird and your returned item +10 phoenix status still verified or? Weeeell, the verified status can be a misleading information too? Should we verify the verified items, then? Edited by mashaa, 18 March 2019 - 01:54 AM. So, the verified status can be a misleading information too? My ticket has been resolved and my old detachment ring turned out to be "real". The GM team this year has been responsive and i encourage everyone to send in a ticket for their issues. It's crazy i went ahead and bought a new old ring expecting them to reutrn my 1.5b zeny, but they said after a deep investigation it turned out to be real. So i ended up with x2 Old Detachment ring and now need to sell my extra one. i think so. RO screen shot helps me a lot i got my new EDA back. well, seems that verified item still can be as a dupe. 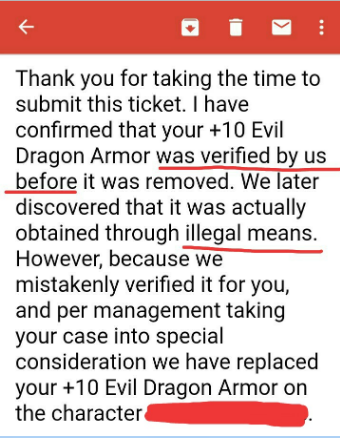 they have logs of everything is actually retarded that you get asked of any proof and that ss kinda proves it they VERIFIED an item then tell you "woops we were wrong"
Is there a way for them to notify us, before deleting these dupe items? Cause there's some people with a lot of them stocked up, to sell later on, and with these items just magically disappearing without you knowing is really lame. Transactions are logged, there is absolutely no need to provide screenshots. The only cases in which the GM staff will ask for screenshots if things don't add up or they would like to clarify the deal with the user. I shall continue to lurk the forums until this dupe shenanigan is fixed. so what will happen if we dont have the screenshot? Edited by YongkySH, 21 March 2019 - 06:18 AM.